You got that right, Mr. Wells. 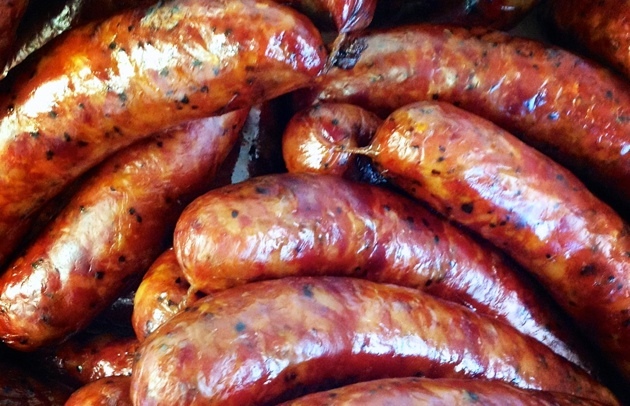 Jake Klein, owner of Jake’s Handcrafted in South Slope, Brooklyn, is one of the most creative sausage makers in North America. And not just because he’s my stepson. Jake has channeled Spanish paella, New Orleans oysters Rockefeller, Miami’s cubano sandwich, and a New York deli Reuben in a sausage casing. To make the aforementioned brisket sausage, Jake folds home-smoked burnt ends into ground fresh brisket meat, which he re-cooks a second time in his smoker. Think of it as barbecue’s second coming. With tailgating season upon us, I asked Jake for his top 10 tips on making and grilling sausage. Even the old man learned something new. Start with whole muscles. The collagen helps give the sausage a supple texture. Make sure your meat is super cold—almost frozen—before grinding. This will give you better texture, facilitate grinding, and help with the emulsification. Use lots of liquid. I push the limits on how much I incorporate. This will help make your sausages juicy and not greasy. Use the right binder. In order to make great sausage you need to set the emulsion of meat and fat. I find nonfat milk powder works well with red meat. Cornstarch is great for poultry. Briefly blanch your sausages in a hot water bath (the water temperature should be not more than 150 degrees). Then shock them in ice water. This helps improve the texture and storage and shortens the cooking time. Place your sausages in front of a fan for 10 minutes before cooking, or dry them, uncovered, in a single layer overnight in the refrigerator. This will ensure a nice snap to the casing. When cooking fresh (raw) sausages, allow them to come to room temperature before grilling. This will keep them from bursting on the grill. When cooking sausages on an open grill, I like to place a plancha or cast iron plate on the grates. This minimizes the risk of flare-ups and gives you super snappy casings. Take your time. Work over medium heat and allow some of the rendering fat to crisp the casings. To speed up the cooking and assure even doneness, place an inverted stainless steel bowl over the sausages as they grill. The helps the sausages cook from the top as well as the bottom. 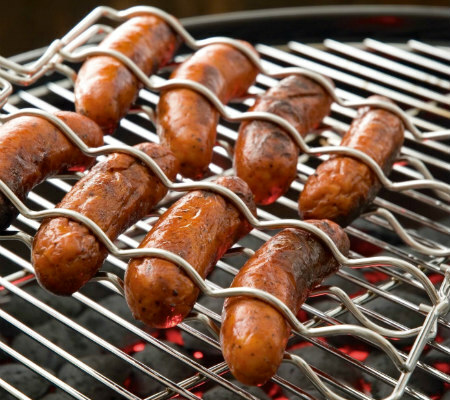 When direct grilling or cooking over a campfire, use a sausage grilling basket. And above all, next time you’re in Brooklyn, visit Jake’s Handcrafted at 559 5th Ave. in South Slope. Tell them Steven sent you. If you can’t get to Jake’s to try one of his sausages, the sausages he recommends in his “Hangover” sandwich recipe are the next best thing. Note: The recipe for Jake’s roasted banana mustard (described by the New York Times as “improbably delicious”) is secret—even for me. But Jake did share his recipe for barbecue sauce.